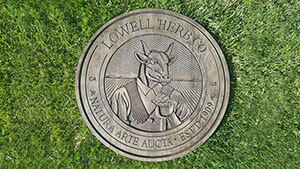 I was tasked with creating a company sign for Lowell Herb Co. They wanted it for marketing purposes. It has since been dsplayed at numerous events including their booth at Coachella. I did a glue up of hard maple several boards and then machined their logo into it. Then I did a series of stains to create a weathered effect. It was then repeated multiple times, distressing with tools, sanding and re-staining to create the final look.